But does this mattress really deserve its glowing endorsement? I won’t know until I match the Mlily mattress up against Team Sleepopolis, putting the bed through my own series of tireless tests, examining its firmness and feel, and helping you determine if this bed could be the perfect match for you. No time for the whole review? No problem. Click here to skip to the bottom for my review summary. The MLily Fusion Luxe is a great bed in a box option for those looking for a soft feel with a little bounce to move around. The cooling cover and hybrid build help those that sleep a bit hot stay avoid overheating at night. Chinese mattress maker Mlily was founded in 2003, with the aim of changing cultural perceptions about sleep as a crucial component of health. By 2011, Mlily was the biggest memory foam manufacturer in China. In 2016, Mlily partnered with British football team Manchester United, a clever strategy that boosted the brand’s exposure and linked the Mlily mattress to peak physical performance. Another noteworthy feature of the Mlily brand involves the design of the pocketed coil system. 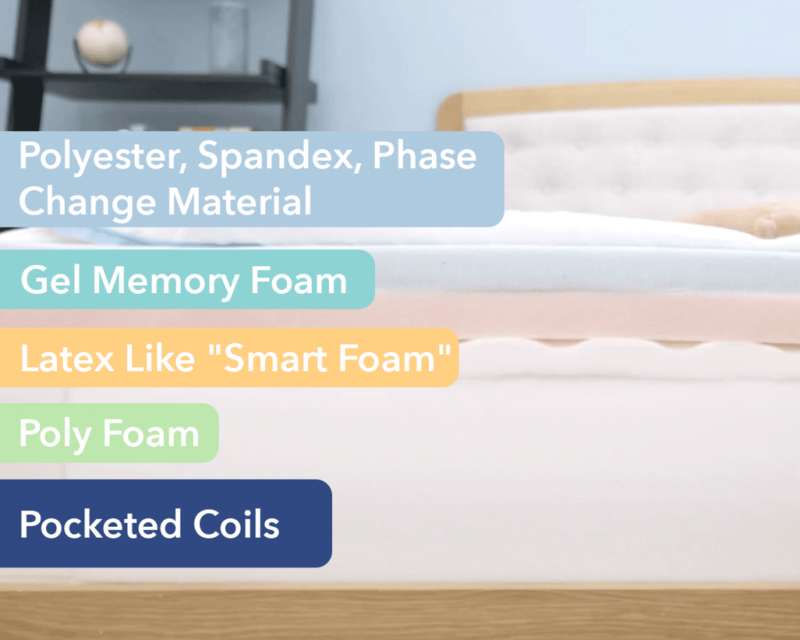 Where most hybrid mattresses transition straight from foam layers into coils or springs, the Mlily wraps its coil foundation in an extra layer of high-density polyfoam, which means the bounce of the coils feels less abrupt and more fluid throughout the bed. With all this in mind, let’s check out this bed’s unique construction. 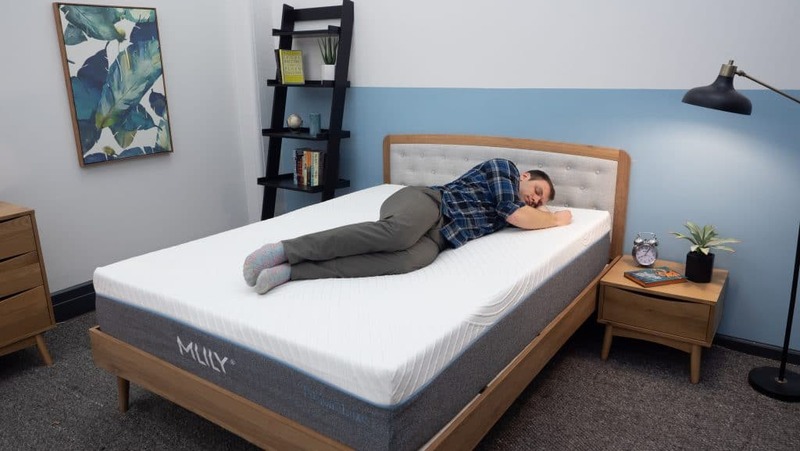 The Mlily Fusion Luxe is a hybrid mattress consisting of both foam and pocket springs, filled out with thick layers of memory foam, latex-like polyfoam, and high density polyfoam. The bed measures just over a foot (12.5 inches) from top to bottom. To see how all these materials work together, let’s dive in and take a closer look at each of these individual layers. 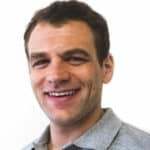 Cover – The Mlily cover is a cooling knit fabric of polyester and Spandex, spun with polyethylene Phase Change Material, or PCM. Though PCM was originally developed by NASA for use in astronaut gloves, it’s now commonly used in bedding to regulate temperature. Its inclusion in the cover makes the fabric breathable and cool to the touch. Comfort – Gel memory foam, known for its slow response to pressure and luxurious texture, gives the bed a super soft, sinkable feel right off the bat. This particular gel memory foam, called AirCell Foam, is also designed with open-cell circulation to increase air flow and help you sleep cool. Bounce – An inch and a half of polyfoam or “Smart Foam,” as Mlily calls it, makes this layer flexible, breathable and supportive. Mlily describes Smart Foam as “Latex-like,” given its comfortable mix of bouncy support and cushy, stretchy softness. This material responds more quickly to pressure than the memory foam above, which means it provides more immediate pressure relief. Transition – Next up, a transition layer of Aero-Flex foam adds firmness and support, helping to disperse body weight gently through the bed. This layer is more firm than the foams above it, with just a bit of cushion. Aero-Flex Foam is named for its aerodynamic design, which maximizes airflow and body contouring. Support layer – The bed’s pocketed coil system provides bounce and stability, allows for ease of motion, and helps to counterbalance the bed’s many layers of lush foam. This layer of coils is wrapped in a border of high density polyfoam, making the transition from coils to foam feel seamless. Now that we’ve seen how this bed is constructed, let’s dive in and explore how this bed actually feels. I got the firmness party started by hopping on the bed and laying flat on my back. Stretching out thusly, I could feel myself sinking deeply into the top layers of foam, which resulted in some pretty intense body contouring and pressure relief. The combo of gel memory foam and latex-like polyfoam made me feel cradled in the bed, rather than positioned on top of it. Firmness and feel vary from person to person, of course, so you might not find the bed exactly as soft as I did. Rather than relying on my own opinion, I gathered a gang of three other Sleepopolis pros to help me test-drive the bed’s firmness and feel. They each gave the bed a personal rating and I assembled their ratings alongside my own on the graph below. Our combined responses should give you a general idea of what to expect with this mattress. As you can see from the graph, my testers agreed on the softness of the Mlily, giving it a combined average firmness rating of 5/10. 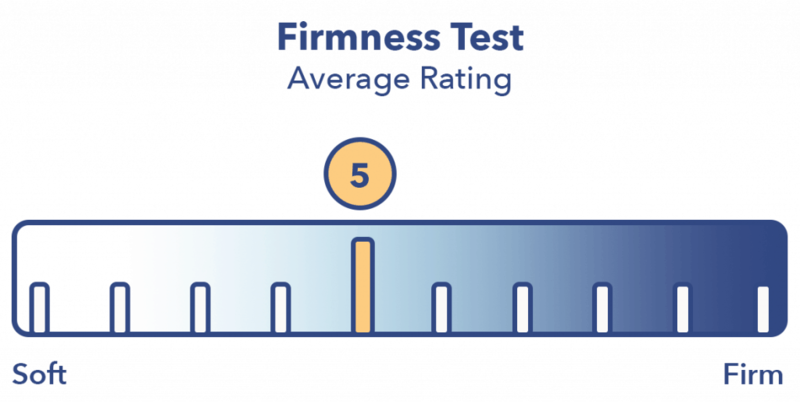 Considering that the industry standard for medium firmness is 6.5, this bed falls well below the threshold for medium firmness, and is undeniably soft. I personally gave this bed a 5, as I found myself sinking easily into the top layers, a little constricted as I moved around, and somewhat enveloped in foam, regardless of position. Super soft beds like this one can sometimes make people feel “stuck” in the mattress, and I definitely got that impression here. That being said, strict side sleepers might love the deep pressure relief and full-body contouring of this mattress. Conversely, I wouldn’t necessarily recommend this bed for stomach sleepers as I could feel my hips dipping quite a bit into the mattress. Deep sinkage quickly created tension in my lower body, a sign that this bed is probably too soft for those who doze in the prone position as they need firm support at the hips to keep the spine in proper alignment. Firmness got you flummoxed? Check out the Sleepopolis firmness guide. We all know the importance of material, size and price in a mattress. But another important feature is pressure. Before buying, it’s always a smart idea to find out if the mattress forms pressure points along the body. To help you visualize this concept, I thought I’d make a handy visual aid to show you where pressure points are most likely to form on the Mlily. I placed a pressure map on top of the mattress and lied on my back, side, and stomach. You can see the results on the image below where pressure is represented from blue (low pressure) to red (high pressure). Back – Lying on my back felt like sinking directly into the bed. Both top layers of foam compressed easily under my weight, filling in every possible space between myself and the mattress and creating a little bit of tension in the hips. It was tricky to move around in this position, which did contribute to that “stuck” feeling I mentioned earlier. Side – When it comes to sleeping on your side, the Mlily performs particularly well. As you can see from the solid blue color above, this mattress maintains low, evenly distributed pressure in a side sleeping position. I felt fantastic pressure relief here, with no tension at my hips and shoulders, and a definite sense of being cushioned, not crammed. The absence of yellow color here is a great sign for side sleepers. Stomach – Diving onto my stomach, I felt my hips dip into the soft top layers and my back arch slightly. While I did feel some pressure relief, I could sense that the softness was overwhelming in this position. This kind of tension in the spine and hips means the Mlily is likely not the best option for stomach sleepers, who need more support and resistance to keep the spine in proper alignment. Like a soccer ball kicked across a field, motion can be sent across a bed. Motion transfer is thus a key feature for light sleepers and folks who share a mattress. Therefore, this test will give you an idea of how much you’ll be disturbed when your partner comes home late from work, or when the family dog hops onto the bed for a nap at your feet. To illustrate, I dropped a 5 kg steel ball from heights of 4 inches, 8 inches and 12 inches and measured the disturbance it caused: the bigger the lines, the bigger the disturbance. 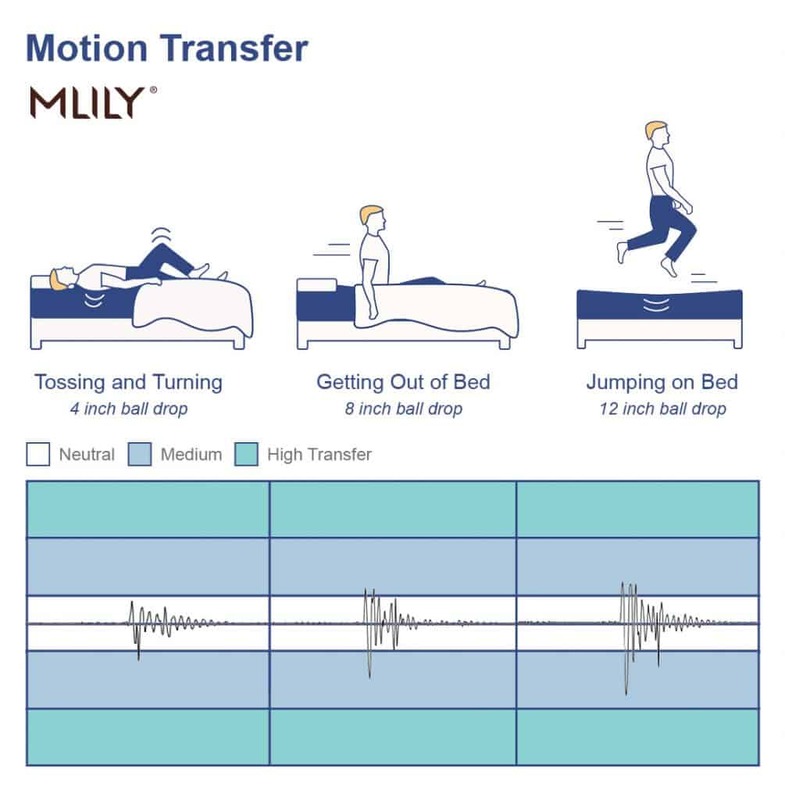 As you can see from these results, the Mlily has extremely low motion transfer, which is great news for couples, restless sleepers, or anyone who likes a smooth, uninterrupted sleep. You’re not likely to feel normal movements and disturbances from across the bed, and even larger motions produced relatively minor spikes in our test. This means the Mlily could be a fantastic choice for light sleepers and those of you who share a bed. We’ve talked a little bit about sinkage already in this review, but in this section we’ll sink our teeth a little deeper into this concept. Sinkage is what creates the feeling of sleeping “in” a bed, rather than “on” it. Side sleepers tend to love sinkage for its deep pressure relief, while stomach sleepers tend to feel swamped or stuck in it. To visualize this bed’s sinkage, I placed four balls (not soccer balls, don’t worry) of varying sizes and densities (a 6 lb medicine ball, a 10 lb steel ball, a 50 lb medicine ball, and a 100 lb medicine ball) on the mattress and measured how much they compressed the surface. These results are some of the deepest sinkage numbers I’ve ever seen on a bed-in-a-box mattress. Although I’m somewhat surprised by the depth of sinkage, these results do make sense given the bed’s super soft foam construction. As I mentioned earlier, I felt myself sinking into the mattress on my back, my side, and my stomach, with minimal resistance. I have a hunch that no matter which way you lay on this bad boy, you’re going to feel way more “in” the bed than “on” it. If you don’t like feeling stuck or blanketed in foam, this may not be the bed for you. But if deep pressure relief and tons of sinkage are your thing, this bed is probably a perfect fit. IS THE MLILY FUSION LUXE RIGHT FOR YOU? 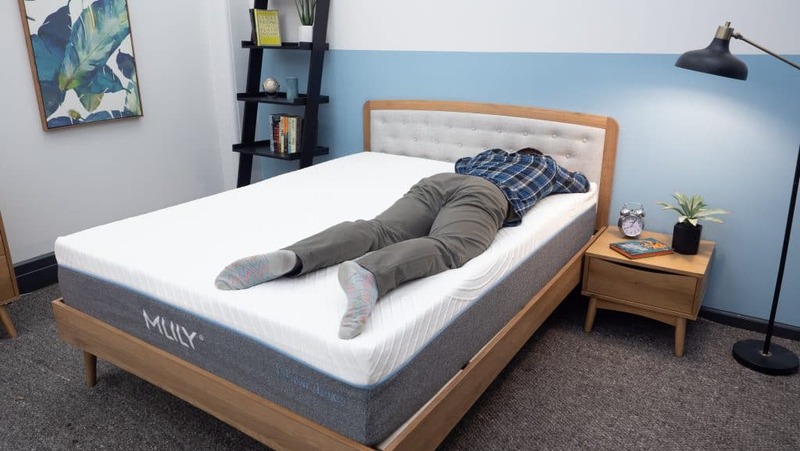 Now that we’ve scoped out the Mlily mattress in all its sinkable glory, let’s outline a few basic reasons this mattress might (or might not) be an excellent match for you. Couples – The Mlily’s super low motion transfer makes it a fantastic option for couples. Even if your partner drops a bowling ball on the other side of the bed, you’ve got a decent chance of sleeping through it. Dense memory foam and lots of sinkage make for minimal disturbances throughout the night. Side sleepers – As I mentioned earlier, this mattress seems almost tailor-made for side sleepers. 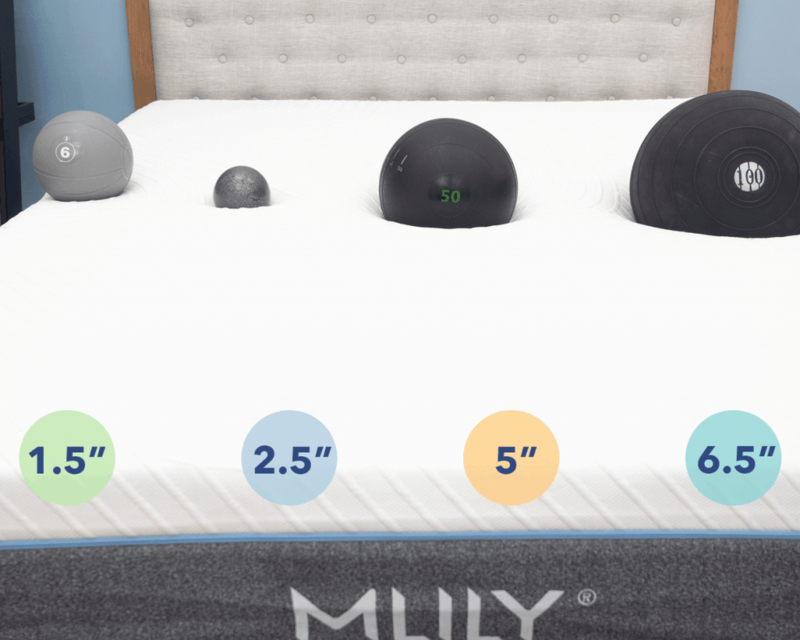 With some of the best pressure map results I’ve seen and enough memory foam to cradle a small elephant, the Mlily’s lush softness and deep pressure relief are ideal for sleeping on your side. 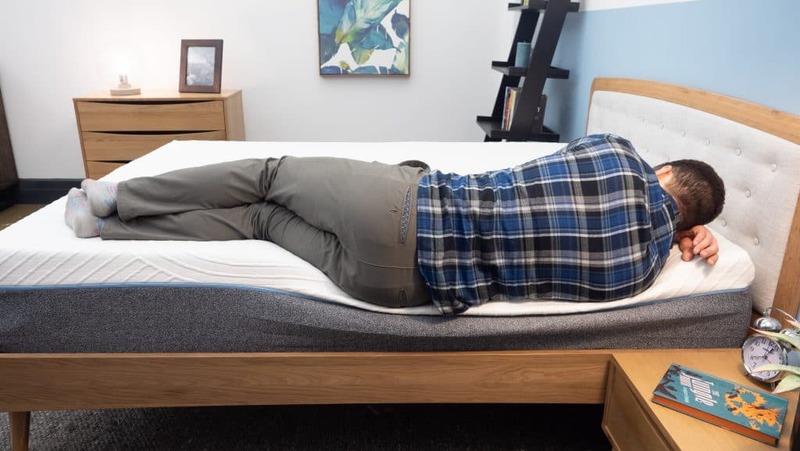 Memory foam that sleeps cool – No doubt one of the neatest features of this bed is the combination of technology it uses to keep you cool and dry while you snooze. Memory foam is infamous for overheating and sleeping too hot, but the inclusion of phase change material and gel infused foam eliminates that risk. 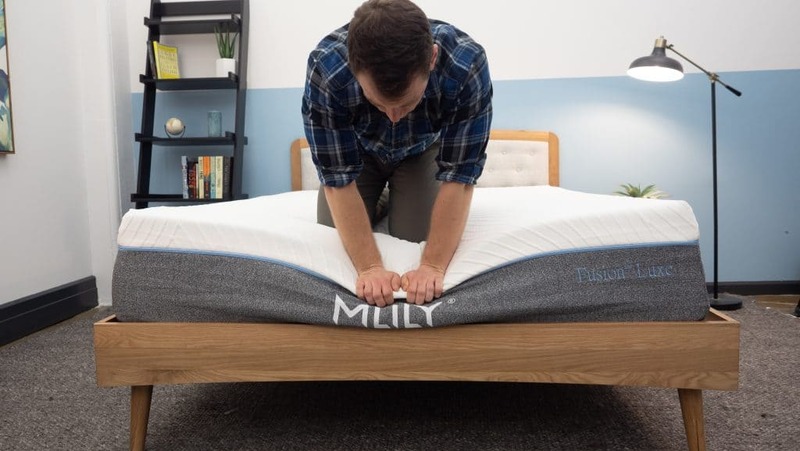 Not great for stomach sleepers – If you love to slumber on your stomach, the Mlily mattress is probably not your top pick. The bed’s exceptionally soft and sinkable layers provide almost no support to the hips, and in fact even throw the spine a little bit out of alignment. Stomach sleepers will probably need a firmer, more supportive mattress with more bounce. Expensive – At $2,550 for a Queen, the Mlily is not exactly budget-friendly. This bed is marketed as a high end product, and the quality of its materials and design are reflected in the price tag. If budget is a concern and you’re looking to save a few bucks, you might want to consider other brands in a less luxurious price range. Always a good idea to check if the bed of your dreams is actually going to fit in your bedroom, right? Take a gander at the detailed size and pricing information below.